The Innovator Awards recognize members that exhibit forward-thinking and pioneering programs that improve access, quality and/or cost-effectiveness of cancer care delivery. LLU Cancer Center created its program to encourage career development and specialization in oncology as an effective alternative to minimize staffing shortages. 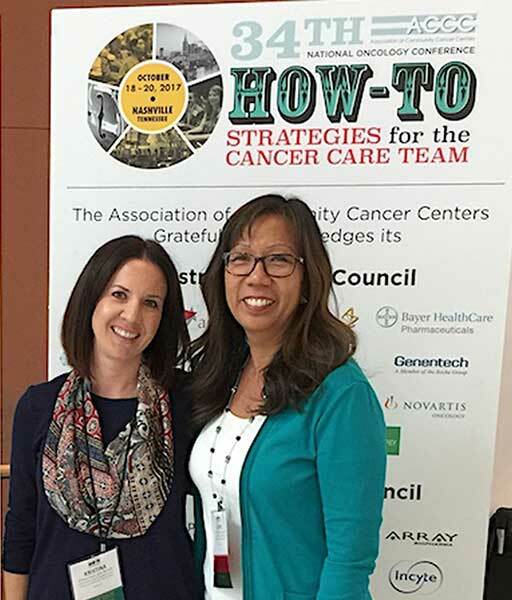 During the ACCC 34th Oncology Conference held Oct. 18-20 in Nashville, TN, Lexine Thall, MN, RN-BC, AOCN®, director of patient care at LLU Cancer Center, and Kristina Chase, BSN, RN, OCN®, supervisor of patient care at Loma Linda University Health Beaumont-Banning, accepted the award on the Center’s behalf. While in Nashville, Thall and Chase had the opportunity to share with various health care organizations how they overcame staffing shortages by thinking outside-the-box. The pilot program launched in 2014 following an analysis of appointment types and RN skill level needed for each visit type. The results showed that 40 percent of the Cancer Center’s supportive care therapies (e.g. hydration, blood transfusions) did not require an RN with chemotherapy skills and oncology experience. The information offered a unique opportunity to fill RN vacancies with experienced non-oncology nurses and create a pathway for RNs to obtain their Oncology Nursing Society (ONS)/Oncology Nursing Certification Corporation (ONCC) Chemotherapy Biotherapy Certificate. Through the mentorship program, 100 percent of participants have attained the ONS/ONCC Chemotherapy/Biotherapy Provider Card. Additionally, 90 percent of the participants attaining the Chemotherapy/Biotherapy provider card have remained with the organization. For more information on Loma Linda University Cancer Center, visit cancer-center.lomalindahealth.org or email cancer@llu.edu. PHOTO CAPTION: Kristina Chase, BSN, RN, OCN, left, and Lexine Thall, MN, RN-BC, AOCN attended the ACCC 34th National Oncology Conference in Nashville, TN.